There’s no way around it—our bodies change as we get older. Sometimes these changes have a big impact on our health. We may find ourselves dealing with more and more health issues as we age. 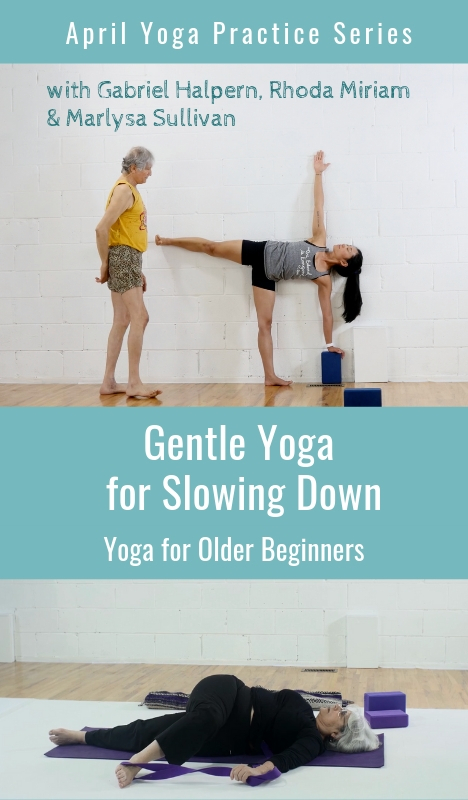 A yoga practice provides many tools for dealing with the changes that occur with age. Research has shown time and time again that practicing yoga has a positive impact on the physical, mental and emotional health of older adults. Here are five common health problems that affect aging adults, along with some of the scientific evidence indicating that yoga may help. Heart disease is the leading cause of death among older Americans. According to the Centers for Disease Control (CDC), heart disease accounts for more than one-third of all deaths in American adults 65 years of age and over (1). In 2014, researchers from the United States and the Netherlands performed a systematic review of the research on yoga and heart disease, which included 37 randomized controlled trials and 2,768 subjects (2). Participants who practiced yoga saw their risk factors for heart disease improve more than those who did no exercise at all. The scientists concluded that yoga improved cardiovascular risk factors and reduced the risk of heart attacks and strokes just as much as cardiovascular exercise. The second leading cause of death among older Americans is cancer, accounting for one-fifth of all deaths in adults 65 and over. Sixty percent of newly diagnosed cases of cancer occur in this same age group (3). Seniors affected by cancer must learn to deal with the symptoms of the disease, the side effects of cancer treatment, and the emotional toll that living with cancer takes. Yoga may have a huge impact on quality of life during and after cancer treatment. A 2014 study conducted at the University of Texas MD Cancer Center looked at 191 women undergoing radiation therapy for breast cancer (4). The women were divided into three groups. One group was instructed in yoga practices, such as controlled breathing, meditation, and relaxation techniques; one group was instructed in simple stretching exercises, and one group received no yoga or stretching instruction. While the women in both the yoga and stretching groups experienced a reduction in fatigue, the yoga group experienced far more profound effects: an improved ability to engage in daily activities, better overall health, and better regulation of the stress hormone cortisol. The women who practiced yoga were also more able to find meaning in their experience of living with cancer, which declined over time for the women in the other two groups. For the one-in-five adults who suffer from arthritis, moving is painful. Just getting out of bed in the morning is sometimes a challenge. Stiffness, inflammation, and pain in the joints may be a constant companion, day and night. This painful condition is especially prevalent in seniors. According to the CDC, nearly 50% of adults 65 years or older were diagnosed with arthritis from 2010-2012 (5). Researchers at Johns Hopkins Medicine followed 75 people suffering from either knee osteoarthritis or rheumatoid arthritis (6). The participants were randomly assigned to one of two groups: a group that practiced yoga or a group that maintained their usual lifestyles. The yoga program was designed by yoga therapist and YogaUOnline presenter Steffany Moonaz. It included twice-weekly yoga classes and a weekly practice session at home. Moonaz, who has many years of experience working with arthritis sufferers, modified the poses for the specific needs of each participant by using props such as wedges and chairs. Balance grows less and less steady with age. As balance diminishes, the likelihood of falling increases. Falls are the leading cause of injury among older adults, according to the National Council on Aging (7). Scientists at Indiana University wanted to determine whether yoga could reduce the risk of falling in older adults (8). They designed a study involving 15 older adults who participated in a 75-minute yoga class twice a week for 12 weeks. Each class included postures and breathing. The classes were designed to build strength in the participants’ arms, legs and feet to help them get up from a fall and improve their confidence in movement. The researchers concluded that practicing yoga may reduce the fear of falling in seniors and improve their balance, effectively lowering their risk of injuring themselves from a fall. Osteoporosis is a disease of the bones. The bodies of those who suffer from it make either too much or too little bone. Eventually the bones weaken and are more likely to break from a fall or, in severe cases, from even a sneeze or a minor bump. The National Osteoporosis Foundation estimates that 54 million Americans over the age 50 are affected by low bone mass or osteoporosis, putting them at risk for a bone fracture or break (9). Dr. Loren Fishman, MD, a yoga therapist and YogaUOnline presenter, headed a ten-year study involving 741 participants who had or were at risk for osteoporosis and osteopenia (10). The participants were given a yoga DVD and asked to watch and practice along with it each day. The 12-minute yoga routine included 12 postures that the scientists believed could enhance bone mineral density. After the ten-year study period, Dr. Fishman and the other researchers examined the data from the 227 participants who practiced the yoga routine more than every other day. They concluded that participants who practiced yoga saw significant improvements in the bone density of the spine and femur. Their results indicate that yoga is a safe and effective way to treat osteoporosis. Practice Yoga For Healthy Aging with Dr. Baxter Bell - A YogaUOnline Practice Channel Series that promotes healthy aging. Chu, Paula. “The Effectiveness of Yoga in Modifying Risk Factors for Cardiovascular Disease and Metabolic Syndrome: A Systematic Review and Meta-Analysis of Randomized Controlled Trials.” European Journal of Preventive Cardiology, December 15, 2014. Sahyoun NR, Lentzner H, Hoyert D, Robinson KN. “Trends in Causes of Death Among the Elderly”. Aging Trends; No.1. Hyattsville, Maryland: National Center for Health Statistics, 2001. Chandwani, Kavita. “Randomized, Controlled Trial of Yoga in Women With Breast Cancer Undergoing Radiotherapy.” American Society of Clinical Oncology, March 3, 2014, doi: 10.1200/JCO.2012.48.2752. Moonaz, Steffany Haaz. “Yoga in Sedentary Adults with Arthritis: Effects of a Randomized Controlled Pragmatic Trial.” The Journal of Rheumatology, vol. 42 no. 7 1194-1202. Schmid, Arlene A. “Effect of a 12-Week Yoga Intervention on Fear of Falling and Balance in Older Adults: A Pilot Study.” Arch Phys Med Rehabil 2010;91:576-83. Lu YH, Rosner B, Chang G, Fishman L. “Twelve-Minute Daily Yoga Regimen Reverses Osteoporotic Bone Loss.” Topics in Geriatric Rehabilitation, April/June 2016 - Volume 32 - Issue 2 - p 81–87.